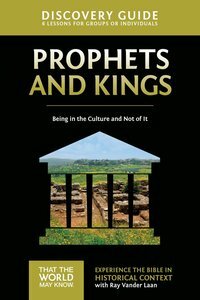 About "Prophets and Kings (Discovery Guide) (#02 in That The World May Know Series)"
Ray Vander Laan is the founder of That the World May Know Ministries and creator of the Faith Lessons video series with Focus on the Family. An ordained minister, he holds the chair of biblical cultural studies as a religion instructor at Holland Christian Schools in Holland, Michigan. He and his wife, Esther, have four children and fifteen grandchildren. SPANISH BIO: Ray Vander Laan es el fundador del That the World May Know Ministries. Cuando no ensenando y investigando en Israel, ensena en Michigan del oeste a un escuela secundaria y un semanario.